A few weekends ago, we went on another camping adventure; this time to Myakka River State Park. You may recognize it from my Quik Shade Pet Bed post or my post with the photos from my Collar Camera. We had such a great time hanging out at the campsite and hiking through the park. I had a blast making waves (barking at alligators and bull frogs) on Upper Myakka Lake in Uncle Robbie's canoe! 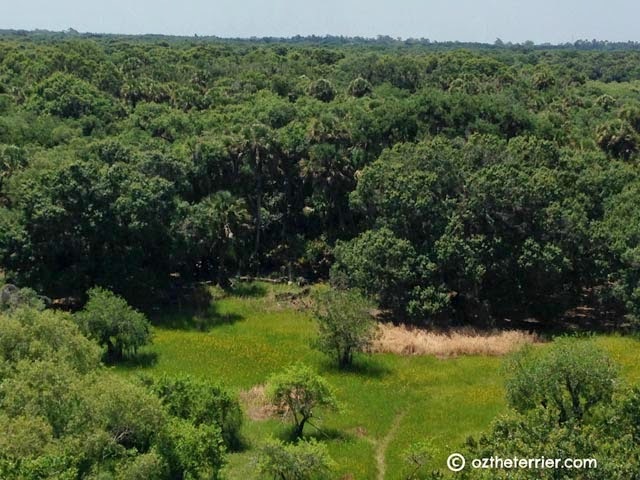 Myakka (my-ah-kah) River State Park is one of the largest and oldest parks in Florida. It is located on the West Coast near Sarasota - however, it is not near enough to Sarasota for there to be any cell phone service. This was our first camping adventure with no contact with the real and virtual worlds! The Myakka River is designated as a Florida Wild and Scenic River and the Park protects the 34-mile portion of it located in Sarasota County. 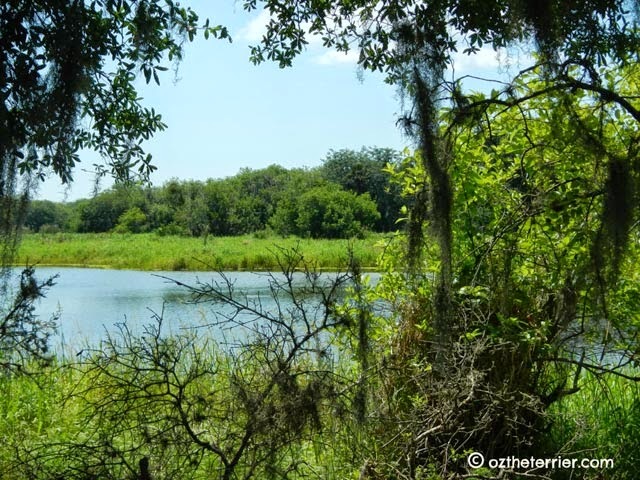 The river flows through 58 miles of wetlands, prairies, hammocks, pinelands and two lakes - the Upper and the Lower Myakka Lakes - both of which are located in the Park. 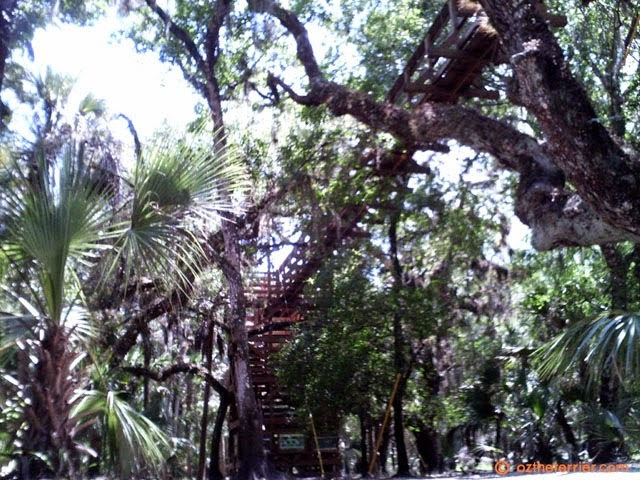 Activities abound at Myakka! You can hike the prairies, hammocks and pinelands and canoe/kayak the river and lakes. The park even has guided tours - a lake tour on a airboat and a tram tour through the backcountry of the park. Since the park is so large, we drove to the boat launch as well as to some of the trailheads. 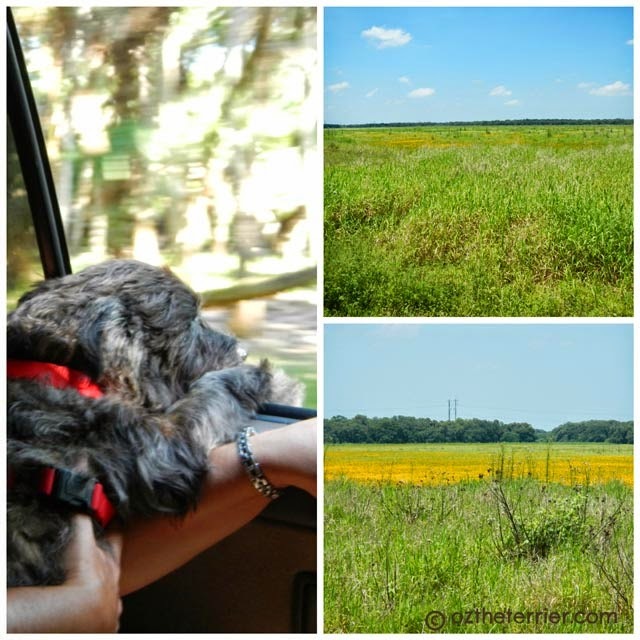 I got to enjoy every sight and smell from the car including a beautiful view of the Florida prairie. That is the 76 foot observation tower, walkway and platform. This was the very first Canopy Walk built in Florida and it is modeled after ones used by scientists in the South American rainforests. Daddy-dog and I stayed below while Ma and Uncle Robbie went up to see the view. Of course, it is never a State Park adventure if we do not go out in the canoe. 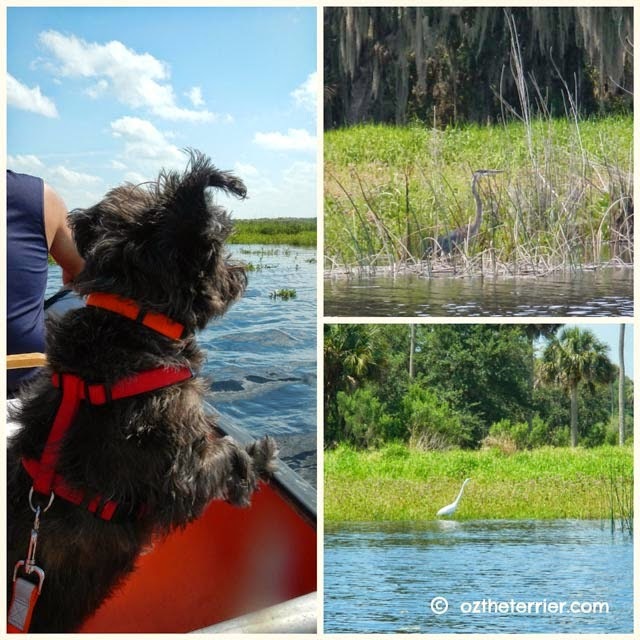 We canoed the Upper Myakka Lake and saw lots of water birds, vultures and native grasses. We came across lots of these pretty aquatic flowers. 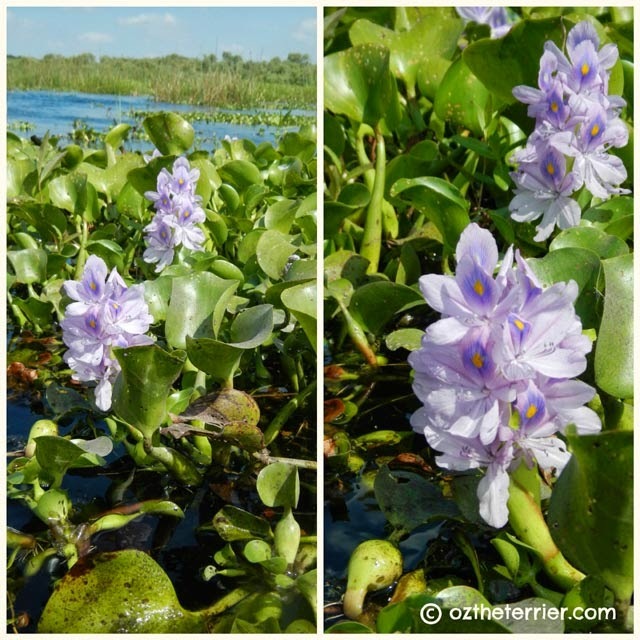 These are water hyacinth and unfortunately, they are another non-native, invasive species here in Florida known to choke rivers and lakes, deplete oxygen from the water and potentially kill fish and turtles. 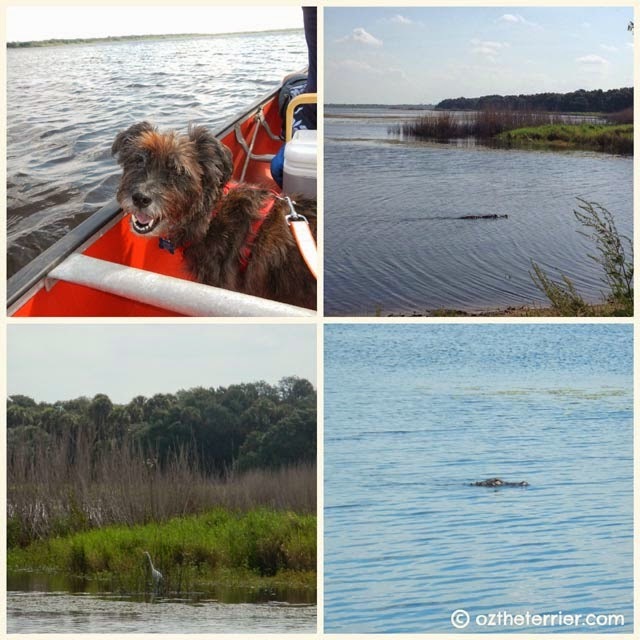 Of course, no canoe trip would be complete without seeing some alligators and Upper Myakka Lake and the Myakka River did not disappoint! We saw more alligators here than we have in all the other State Parks combined. This was the first canoe trip that so many alligators were active too. As we canoed, we sometimes had to slow down for a gator to swim by. 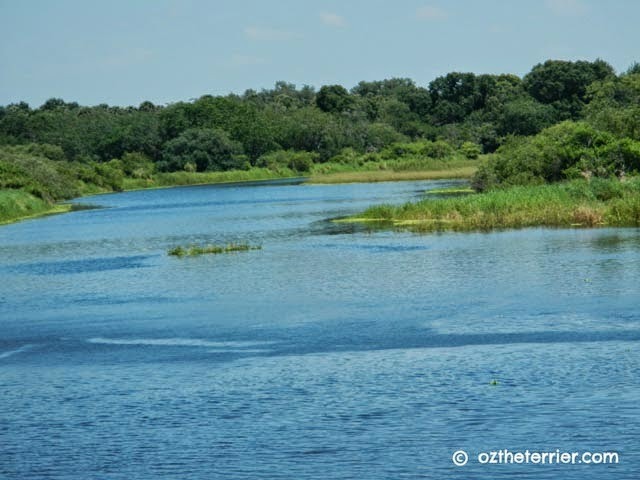 If you are ever visiting near Sarasota, I highly recommend you go to Myakka River State Park. You can see so many different animal species in all the different types of Florida habitat. And you will definitely see plenty of alligators! What a beautiful park Oz. We would have been very scared of the gator, you are very brave. Have a lovely day! what an awesome place and we love that there is no cell reception. I think we would be a bit worried about the gators but I guess if you don't bother them - they won't hopefully both you. Love the wold flowers. Mom would love to take the tours. She freaked out when she saw the gators. You are so brave. It is sad that something so beautiful as the flowers could be so deadly to the environment. BOL BOL funny Gator Snack Oz. You are one brave pup. What a wonderful place (except gators) to go for a hike. The views are stunning. Have a fabulous Friday. You wouldn't be getting me on the water or so high up. Last summer we had a road trip to Glacier Nat'l park in Montana and got a personal guided tour from a retired park ranger. Yes, Kaci and I were on the tour but Kali missed it because she wasn't part of us then. You can check it out on my blog-at the end of August and the first post of September last year. Did you wanna chase those birds hiding in the grasses? I would! Wow!!!!!! How beautiful is that!!!! That is an amazing place Oz! Just be careful those alligators don't bark back! WOW! You have the most AMAZING parks! Now that our weather is FINALLY good we are planning on having some park trips ourselves! Looks like you had so much fun. I love the pictures of you on the boat. Nothing as exciting as alligators! My friend calls Mr. N a hors d'oeuvre because she says he's not big enough to be a meal! Those flowers are pretty but too bad they aren't good for the area there. Too many alligators for me I think! Yikes! Gator Snack is a very funny name for you Oz. BOL! Yikes! You are brave. Mom wouldn't go near that water with the gators. She thinks they might tip the canoe and eat everyone in it. Looks like an awesome place with the exception of the reptiles. you have such beautiful places to go adventuring! Oh boy, you and your humans are very brave, Oz, to go out there with those gators. "Gator-snack" - LOL....good thing you have a sense of humor! When we visited Texas it was the first time we saw gators and I was completely freaked out! What a beautiful place though. Those flowers are so pretty, it's hard to believe that they are a bad invasive species! That looks like such a beautiful place to visit! Steer clear of those gators, Oz! Great park. Besides the Dingoes, I may see a rabbit, a skunk, a coyote, or a snake but no Gators. Gators would be pawsome to see. Looks like a very cool park! Looks like you all had a great visit and glad you weren't "gator snack"!! That is one lovely park for a camping trip. What a beautiful park. Thanks for sharing it with us.